Anyone who operates a business, no matter how small or large it is, can always benefit from high quality, professional photos. The most obvious benefit is that pro photos boost a company’s image, thus making the public pay more attention. Not only that, it will make current consumers more likely to keep picking your company over any other. 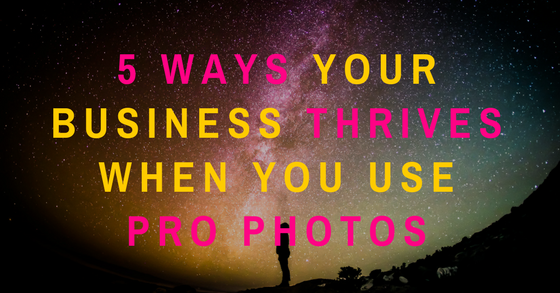 But there are many MORE ways great photography can help a business thrive. Here we uncover five ways professional photography does just that. A More Flattering Appearance: If you want your business to stand out in the crowd, you can’t just hope that it will. You need to take actionable steps to make that happen. And part of separating yourself from your competitors is making sure you have a polished, eye-catching professional image. If a bride is getting for her wedding day, she will most likely go to the salon to have a professional stylist do her hair for her rather than style it herself. Why? Because she knows the stylist has more experience in hair and can make her look perfect for her wedding day. The same logic can be applied to businesses. Why spend hours trying to photograph products only to end up with less-than-flattering images that don’t capture the right angles when you can have a professional guarantee that you’ll get flawless, stunning images? Higher Conversion Rates: When you have professional photography, especially if you own a business that sells material goods, you will undoubtedly experience higher conversion rates. 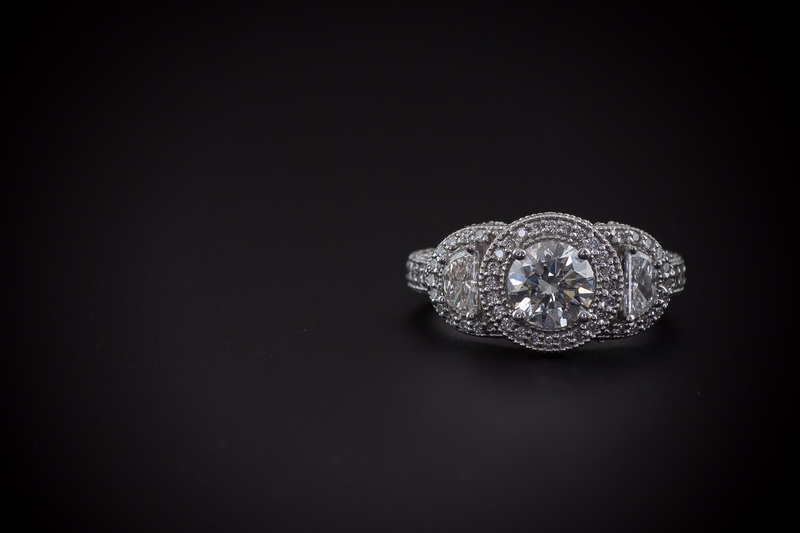 Professional photographers know how to capture the right images to highlight the strongest points of the product you’re selling. They use the right lighting, angles, and a number of other factors to enhance the look of your goods. Consumers are much more likely to purchase something that looks good in a photo than they are something that, while it might be a perfect product, simply wasn’t captured the way it should have been. More Exposure: High quality, professional photography of your company, employees, products, and behind-the-scenes action are great ways to really beef up your marketing campaigns. When you have sleek photos implemented into your company brand, there really isn’t a limit to how much exposure you can receive. You can use the photos across social media platforms, your website, email newsletters, and printed marketing literature. And of course, when you share stunning images on social media, there’s a good chance your followers will share those images with their friends and followers, where you’ll receive more free publicity. Added Personality: Your business, while it isn’t a person itself, is comprised of people that make it successful. A professional photographer won’t just snap a few generic, uninspired shots; they are creatives and they know how to add personality and flare to the images they take. Your business has a brand, a mission, and a personality and a professional photographer will bring all of that out in every image they take. Naturally, showing your company’s uniqueness will make it more appealing and noticeable to your target audience. Putting a Face to The Brand: Eventually, you’ll want to invest in corporate head shots to show the public the faces behind the brand. Recruiting an amateur photographer or someone who has poor camera equipment can damage your company’s professional image. But when you invest in an experienced photographer, you can be guaranteed that you are getting images that showcase your team’s traits, skills, and appeal…all in one seemingly simple head shot. Looking for more reasons to hire a professional photographer for your business needs? Don’t hesitate to contact us today! Anyone who is running a business understands the multitude of responsibilities that come with maintaining a flawless professional image. From outstanding customer service to perfectly executed branding strategies, there seems to be no end to the work that must be done. One way to relieve yourself from some of the demanding operational tasks, while simultaneously garnering something invaluable in return, is by investing in professionally done photography for business — for both offline and online marketing purposes. If you have never before worked with a professional photographer or used professional photos before, check out these four reasons why you should have professional photography for business. It Strengthens Your Brand: Having sleek, professional imagery on your social media presence, website, brochures, and other pieces of marketing literature will be tremendously beneficial for the strength of your brand. Clear, consistent brand identity that resonates with your customers is a sure path to more sales. A professional photographer will help align the photos they capture with your brand identity and ensure that the message you aim to convey is clearly presented. Rather than relying on a staff member or amateur photographer to take photos, work with a professional who will make sure that each and every image your business presents is on point. Professional Photography Helps Enhance Your Vision: If you are looking for some creative input and a fresh perspective, a professional photographer will give that to you. 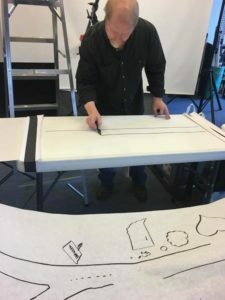 Because of their artistic eye, they will be able to capture things you might not have seen before or suggest new ideas that you didn’t even consider. Discuss the vision you have for your business and the overall professional image and watch how a photographer can take that and build upon it. 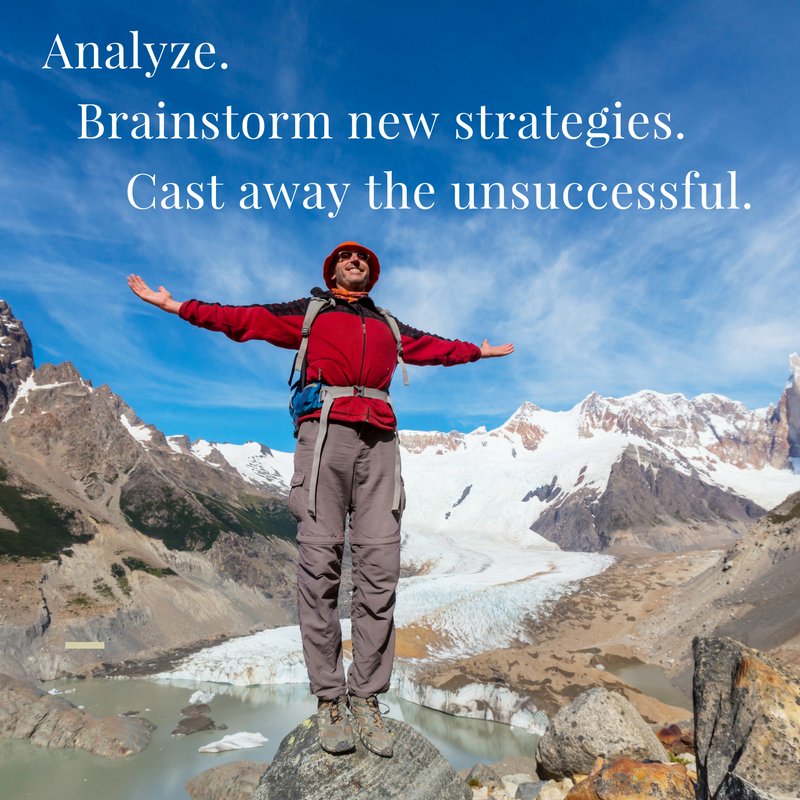 Additionally, you may have a vision in mind, but don’t know how to effectively execute it the way you want to. A professional photographer will use powerful photos to help send the important message you want your target demographic to hear. After all, “a picture is worth 1,000 words”. Professional Images Attract More Potential Clients: Fewer things turn off potential clients quite like images that are blurry or of poor quality. Professionals who manage companies of any size should understand that their images, whether online or offline, are a reflection of their business. If you have images that are of poor quality in your marketing literature or on your website, potential clients may very well assume that the way you conduct business is also done poorly. Showcase professional images to give your potential customers a sneak peek of the professional service that they will get from your business. First, wow them with impressive photography and once you have captured their attention with that, wow them with your impeccable service. Professional Photos Improve Your Content: If you are a business with a large online presence, lots of content, and perhaps a blog on your website, professional photography will prove to be a huge asset for your online image. Professional images not only spice up reading material and capture the reader’s attention, they make reading content exponentially easier for them. When content isn’t easy to read, it is more difficult to keep your reader (who is a potential customer) engaged in the material. However, when you add sleek, interesting photos to your blog and website content, you are maintaining their attention for longer and possibly converting them into paying customers. Don’t miss the opportunity to captivate your audience with great content simply because you didn’t include great photos with it. 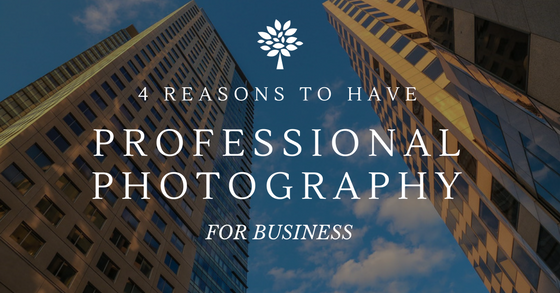 Want to learn more about the benefits of professional photography for business? Don’t hesitate to contact us today. Our team of professionals is eager to share with you the ways we can help boost your business brand and cater to your other photography needs. 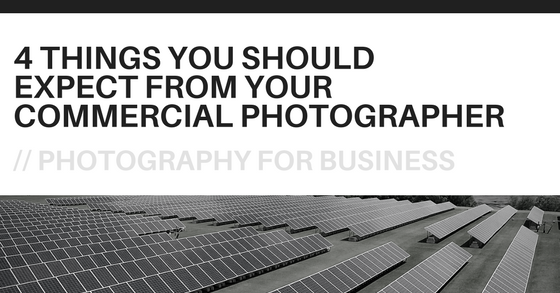 At some point in the growth of a professional entity — whether it is a large corporation, mom and pop retail store, or an office building — will be a need for sleek, professional photography. You’ll want to display images on your website and in marketing literature that impress your target demographic. In order to do that, you’ll want the best images you can get. You’ll need to hire a commercial photographer. And that’s why you won’t want an amateur doing the photography work; it’s best to invest in an experienced, specialized photographer. And to get the best photographer for your needs, there are some things you should consider. In this post, we will go over five critical questions to ask before you hire a commercial photographer. What Photography Experience do You Have? This is one of the most obvious questions to ask, but is more in-depth that one might realize at first glance. When you ask this question, some photographers may give you a vague response by simply showing you a portion of their work or merely divulging the number of years they have been working. What you really what to know when you ask this is what specific type of photography they are most experienced in shooting? If a photographer tells you they have 15 years of wedding photography experience, it won’t matter if you need a commercial photographer. Before you hire a commercial photographer, make sure your photographer has experience in your speciality. 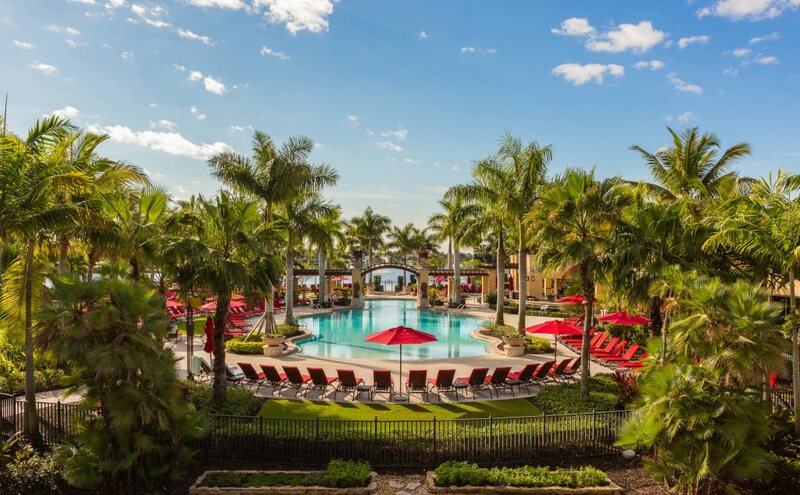 PGA Golf Resort, FL. Image by Miceli Productions PHOTO + VIDEO. Can I See Some of Your Work? Any reputable photographer has a body of work known as a portfolio that is readily available for potential clients to view. Usually this portfolio is found on their website, a professional portfolio site, and on social media. Get familiar with the photographer’s style and make sure it reflects exactly what you are looking for with regards to your commercial photography needs. By checking out their portfolio, you can also get a sense of their versatility and creative eye along with a view of other types of photography they might specialize in. What do You Need From me? Depending on the style of the shoot and the goals you have for it, you may need to supply your commercial photographer with a few things. 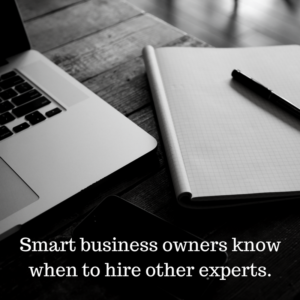 Ask them what they might require of you before hiring them for the job. If you want several different commercial spaces photographed, they might need a complete list of all the areas that you want photographed along with any specifics. If you’re asking them to photograph large products, ask them how they operate to manage the shooting day. Every situation is unique, but by discussing it you’ll be prepared to get the best shots. 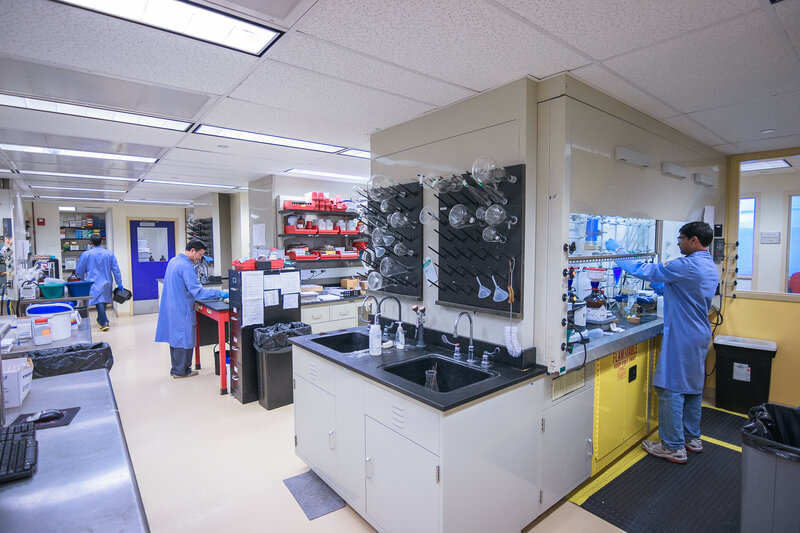 Commercial photography for laboratories and scientists, image by Miceli Productions. Do You Need to See the Site Before Shooting? Depending on the complexity of the photo shoot, some commercial photographers will need to see the site beforehand. They may want to search for natural light sources, weather, consider particular angles to use, and evaluate what equipment they will need to bring with them. Should the photographer need to meet with you before the actual shoot, make sure to have a day and time when you are available to discuss the specifics. What Does Your Fee Include? You don’t want to jump into hiring a commercial photographer if you can’t afford them. Make sure that you know what the cost will be before going forward with the job. Typically, photographers will require a deposit ahead of time and then will invoice you after the photo shoot. Don’t be afraid to ask them what the fee includes and get an itemized list of what everything costs. Group photo at Amphenol HQ, Wallingford CT. Photo by Miceli Productions PHOTO + VIDEO. 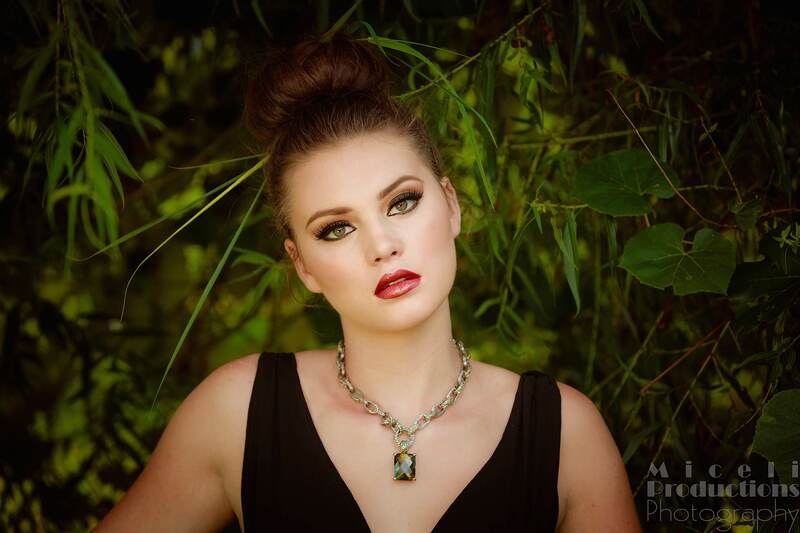 Looking for more advice on hiring the perfect photographer? Don’t hesitate to contact us today! We have an extensive list of photography services, as well as offering video production for businesses looking for marketing and advertising content. Professional photos should look, well, professional. Having said that, however, we also understand that there are many professionals that could easily make use of a few props for a clearer picture of who they are and what they do. First impressions really do make a huge impact. The more information that you can present to a client, without appearing overbearing, the better. 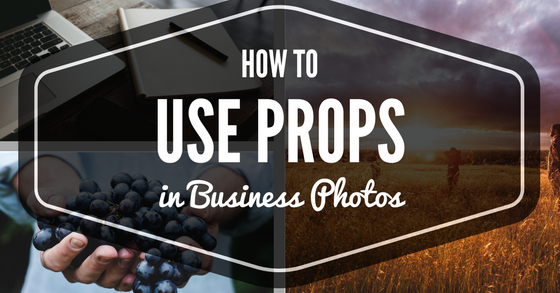 Now, with all of that in mind, you might be wondering what kinds of props would be appropriate and when to use props for you professional commercial photographs. First of all, understand that sometimes, breaking off from the norm can be a great way to stand out. In today’s world of fierce competition, it can be good to set up a shot in a way that catches a clients eye and makes them look just a bit longer. So let’s take a look at some different prop-worthy ideas. 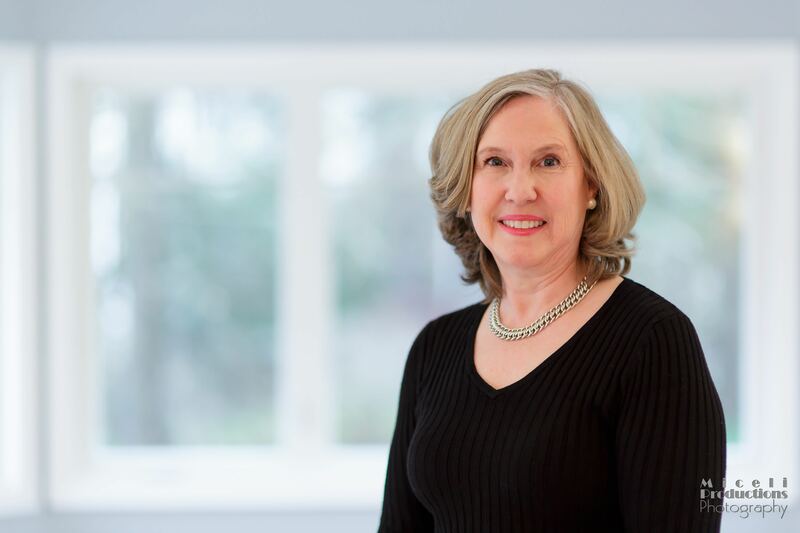 Portrait of real estate agent Darcy Sledge by Miceli Productions. This image uses a window element to connect her image to being a real estate agent. This is a great choice for the professional who might be looking for something a little more chic than the average professional photo. It could be something as simple as a differing pose such as an arm over the knee, a jacket thrown over the shoulder or relaxing in a comfortable chair. These are great for professionals such as bankers, real estate agents and educators. Or, you could make use of your surroundings for a great professional shot. Using the backdrop of a conference room can relay your professional demeanor, as can sitting on your office sofa with a laptop nearby, or sitting at a desk with an open book in your hand can show you in your element. 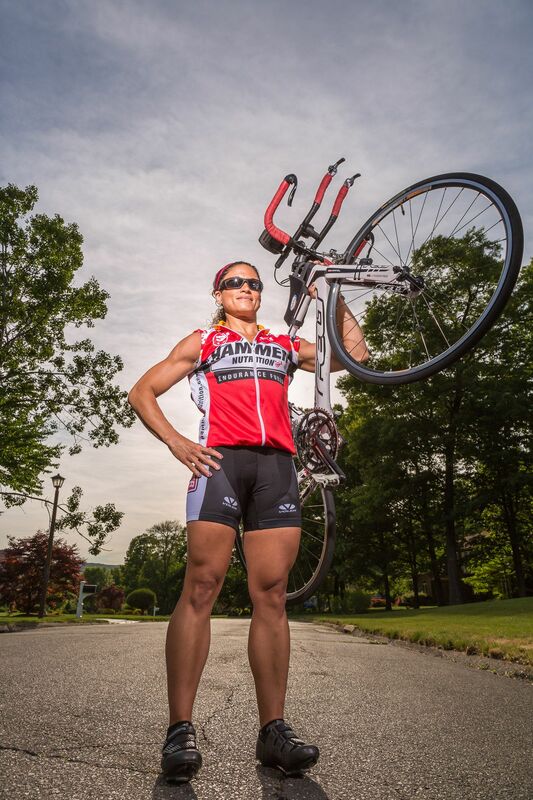 Fitness and sports photography by Miceli Productions. Sometimes a professional shot can be brought to life by simply moving outdoors. A wonderful choice for those in construction, architectural design and gardening, an outdoor shot can epitomize the real you. In this niche, you can turn half-built buildings, modern art sculptures and lush greenery into the perfect prop. Again, the idea is not to go overboard, but to put enough of your persona into the photo that people may not even realize why they are drawn to you. A tasteful choice of attire for the photo will surely seal the deal. Portrait photography for doctors, CEO’s and executives by Miceli Productions. Executives often get trapped into the same old professional photo with a near-generic look that can leave you blending in so much that you get lost in the crowd. However, with the right use of ambiance and a tasteful prop placed just so, you can turn your professional shot into something so savvy, all heads will turn in your direction. Choosing a different setting can really make a difference, such as utilizing a lobby instead of an office or board room, or you can make a statement by staring back at the camera, and your potential client, from a mirror. Executives are people too, and sometimes it’s okay to capture that as well. Sports and fitness photography by Miceli Productions. This image is a portrait with a digitally composited background. There may be times that really warrant the use of a digital background as opposed to something natural. If the season is in direct contrast to the type of professional photo you want or need, you might be better served by this option. 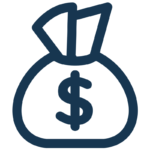 The possibilities can literally be endless and makes a great choice for those in such complex businesses as advertising, web services or freelance services. A freelance writer might want to be photographed in a prestigious library, for instance, but travel may make that impossible. Digital background can create that look for you, right from the comfort of our nearby, professional studio. These are only a few of the many options you have for selecting props in your professional commercial photos. Contact us to help make you stand out in your industry. If you run a business, particularly one with products and other material goods to sell, it is inevitable that you will need to recruit the professional services of a commercial photographer. And when it comes time for you to have your products photographed, you naturally want a photographer that knows how to give you everything you need in order to see your business thrive. In this post, we will uncover the four things you should expect for your commercial photography experience and what should come out of that experience. A lifestyle product photography image for Apogee and Sennheiser by Miceli Productions PHOTO + VIDEO. Investing in professional commercial photography means adding more to your promotional arsenal. 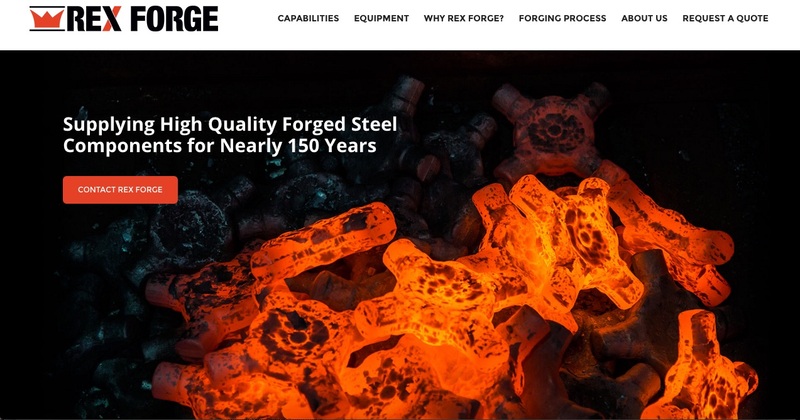 Once you receive professional images of the products or other professional materials you needed photographed, you are free to use those images in countless ways. The photos will enhance your social media marketing strategy, email marketing campaign and newsletter, website, brochures, signage, and other pieces marketing literature. Impeccable, professional images of your business, staff members, products, or other components of your company will have an immediate and positive effect of your brand. Image is an important aspect of business (especially sales and establishing trust with your target audience) and will be a part of your brand identity. Those images allow you to provide the public with a better sense of what your business is, what it does, and what it has to offer them. Photo by Miceli Productions PHOTO + VIDEO. Think about the last time you were online shopping as you saw a stunning product that immediately caught your attention and impressed you. What was the image of it like? Was the photo blurry or poorly lit? Did you notice what angles of the product were taken? Commercial photography of any kind is much more effective when done by a professional, specifically when it comes to photography of products. Whether you are a huge corporation, fashion line, or small Etsy shop, if you want to have better sales, you need to have the best images. Humans are visual creatures; they are instantly attracted to thing that look good. Even if you have a great product, if it’s photographed poorly, that will make consumers think the product isn’t good enough. It goes without saying that even businesses with the same basic qualities are all unique. 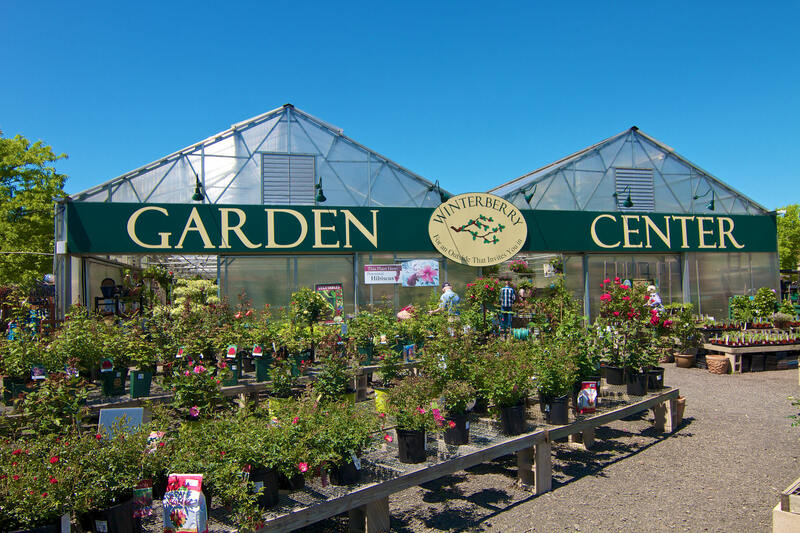 No matter how similar they may seem, no two businesses are alike. Recognizing your business is unlike any other is an opportunity to draw out all of your unique qualities. 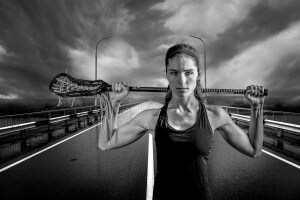 A professional photographer will help you identify those unique qualities and capture them through stunning commercial photography. If you opt for free or cheap stock photos to upload on your website or marketing literature rather than having photos of your actual commercial space or your products photographed, you are robbing yourself of the opportunity to show off your unique qualities. If you are stumped on what ways you can engage your target audience with unique images, there is no need to worry! A talented commercial photographer will come prepared with plenty of ideas on ways to capture the attention of potential customers through your company photos. Want to learn more about the benefits of commercial photography? Don’t hesitate to contact us today. Our team specializes in commercial photography and video production for many different types of clients. Whether your need a commercial space or product line photographed or stunning video content for your branding strategy, we are here to help you achieve your goal. Sometimes a marketing video has to also work as an effective, captivating explainer. 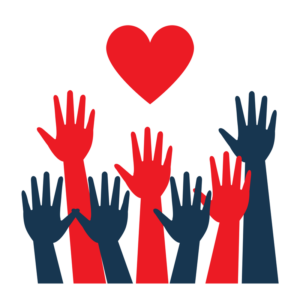 If your product or service offers specific advantages that are not commonly understood by your prospective audience, buyer education is in order. 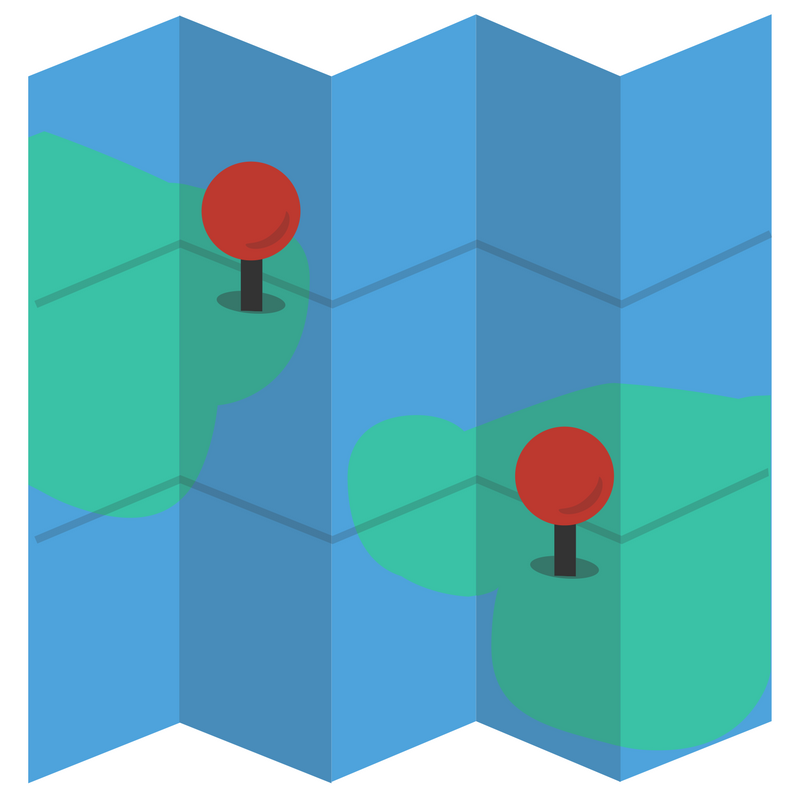 You will want to show unexpected features to your prospective customers in an engaging way. Have a look at our latest project, introducing the Stanley DURA-GLIDE™ GREENSTAR product, where we took advantage of the animated whiteboard approach to engage the viewer and introduce the product. This project set out to clearly depict the notable features — such as the energy efficiency advantages — of this elegantly engineered sliding glass door system, defining terms visually by live-drawing them as the presentation proceeds. We worked with the accomplished illustrator Chris Kunze in creating this piece. All of our work involves collaboration with our amazing clients. 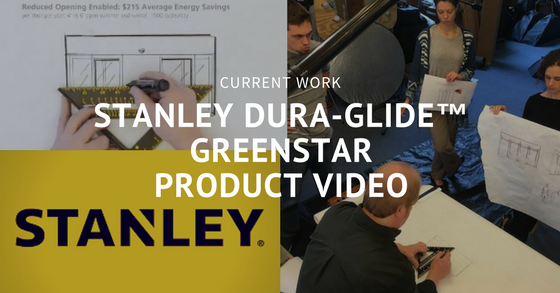 We produced the Stanley DURA-GLIDE™ GREENSTAR product video by working closely with the team at Stanley Access Technologies, starting from their initial vision of the company voice and the product itself. You’ll notice the value this video can provide to a first-time customer by seamlessly introducing new terms and ideas — such as the GreenFit Sealing system air restriction blocks. As you watch the video, you see that term defined with a combination of animated sketches and actual sections cut from a door. No time is wasted explaining the vocabulary — it is simply shown, live, as the presentation flows. The more experienced viewer does not feel talked-down-to when this happens since the definition takes place visually as part of the action, not as a lecture or a caption, while the features are discussed. There is no visual approach quite like the hand-drawn whiteboard video. As you may imagine, the costs of a video created in this manner can be quite reasonable. You have no location shooting logistics or costs. The cast, costume and set design talent is limited to one illustrator plus a voiceover, possibly a member of your company, and a production assistant. Often this means just one camera and one camera operator need be present. The parts of the process that endure in this stripped-down scenario are familiar tasks we enjoy taking on. First, we work with our clients in an idea development process as we would in any video project. Once we have the idea defined, we can move into initial drafts and then complete our scripting. 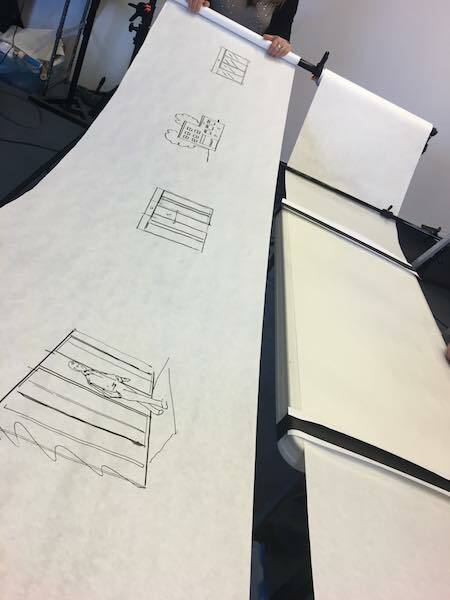 The shoot, in this style of videography, is the recording session with the illustrator live-drawing. As you can see in the Stanley DURA-GLIDE™ GREENSTAR product video, there may be other props to assemble related to the product. After the shoot comes the editing, where we tighten it all up and add the soundtrack, working in close consultation with the client. 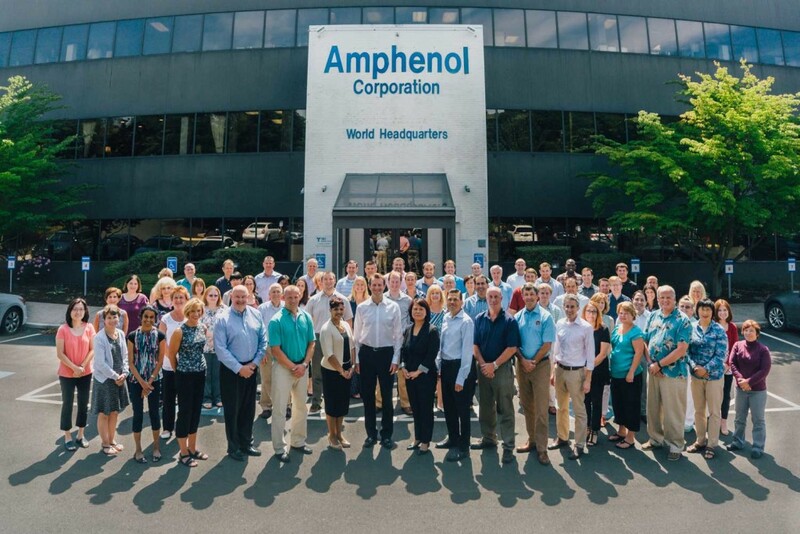 One of the things we love about our work is that we meet great people with notable products. This one, again, proved to be more interesting than we first expected. These automated sliding doors reminded us what retail establishments can do to provide a pleasant and more environmentally friendly experience for visitors, while adding energy cost savings to their bottom line. Read more about the DURA-GLIDE™ GREENSTAR 2000 AND 3000: AUTOMATIC SLIDING DOOR SERIES here. Both the company and the product impressed us even more as we learned about their features. We’re proud that both came across in the video. We get that your product or service is entirely different. We want you to know that when you work with us, we pledge to become deeply aware of your unique product or services. We believe you can appeal deeply to your target audience, while also getting noticed by those outside your core demographic. We have the track record, as well as the contemporary media awareness, to ensure your video will nail it. We’re not merely trendy, but do we know the current trends — as well as what’s cringingly passé — and we can help you understand how to work with what’s cool or what’s solidly mainstream. Get in touch to talk about what you most want to do and to learn what’s possible. Want to see a little behind the scenes? From hallowed halls to wide open spaces. From average Joes to famous faces. From everyday events to unimaginable places. and 2017 promises even greater adventures. 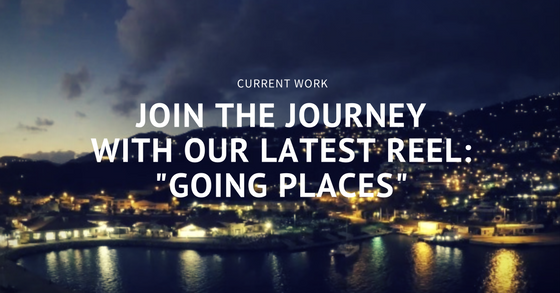 We’d like to invite you to join us on the journey by sampling our latest reel: Going Places, then learn how we can help your business or organization set a new pace for your marketing outcomes with professional video production. 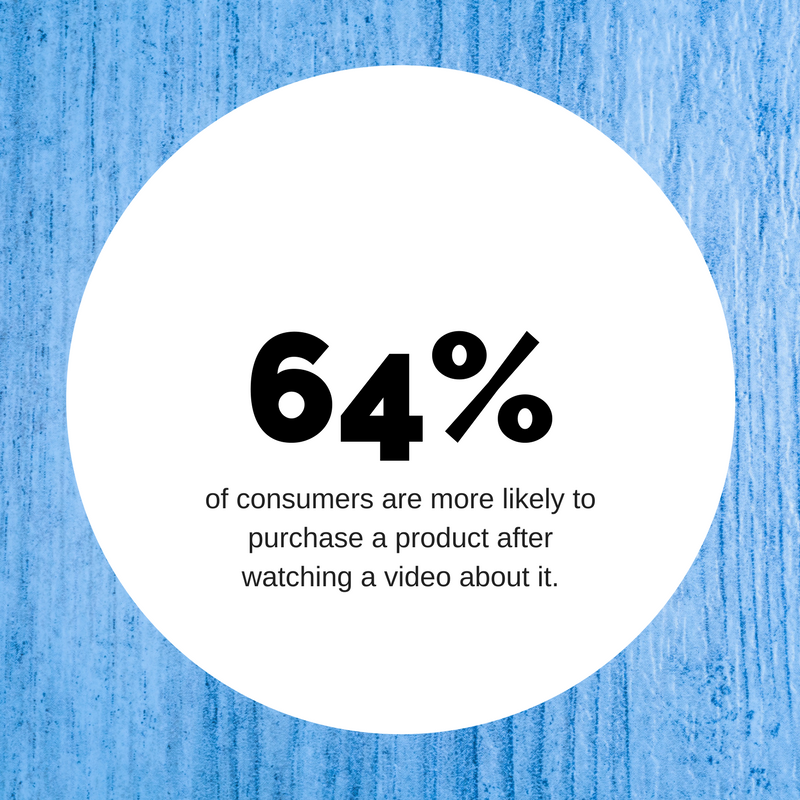 • 90% of consumers note that seeing a video about a product before purchasing is helpful in making a decision. 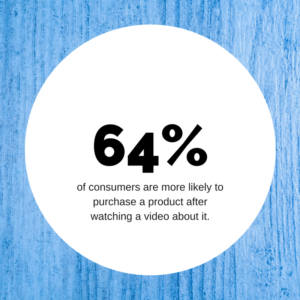 • ComScore reports that 64% of consumers are more likely to purchase a product after watching a video about it. • An Australian real estate company reports it receives 403% more inquiries about properties with video included in the online listing than its listings without video. • Research by Forrester found that including a video in an email leads to a 200% to 300% increase in click-through rate. We could go on and on with these kinds of statistics about the effectiveness of video marketing, but we sense your eyes are starting to glaze over, so we’d like to touch on the importance of compelling, professionally produced video then leave you with some trends we see coming for 2017. OK, we fudged a little about getting away from the statistics, but we promise this will be the end of it. According to Visible Measures, 20% of viewers will abandon a video in 10 seconds or less, 45% will turn off a video in less than 1 minute and 60% stop the video by 2 minutes. Those numbers beg the question: How do you keep viewers engaged? How do you ensure your video reaches that 40% plateau who watch through your entire video? That’s where professional video production provides the answer. 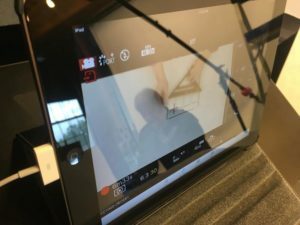 With the proliferation of devices that can record high-quality video, more and more people think they can produce video that viewers will want to watch. And they think they can do it cheaply by turning it over to someone in-house. But producing a quality video involves more than pointing a camera and letting it roll. 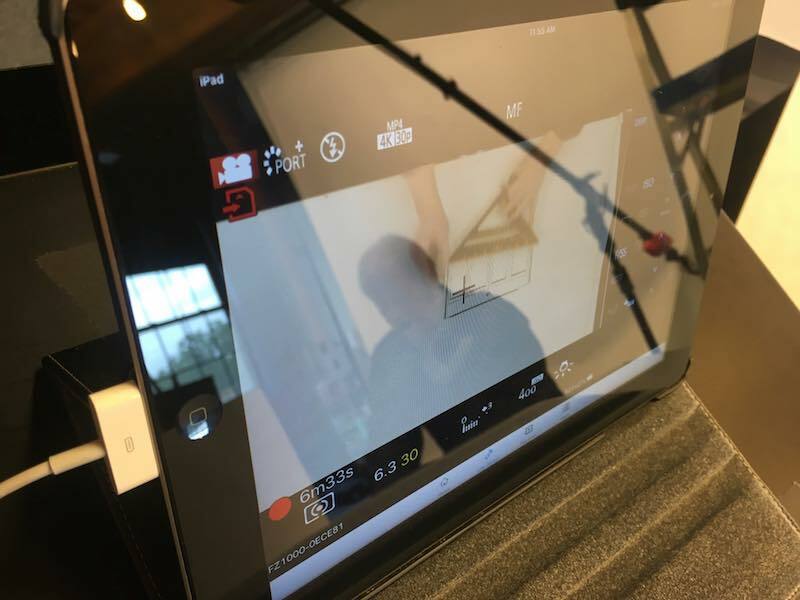 Producing a quality video requires planning, understanding visuals and lighting, ensuring quality sound, editing out the boring bits – skills a professional video producer brings to the job without requiring training and lost time making mistakes. While hiring a professional creates a higher up-front cost, you increase the return on investment from a quality video your audience actually watches. 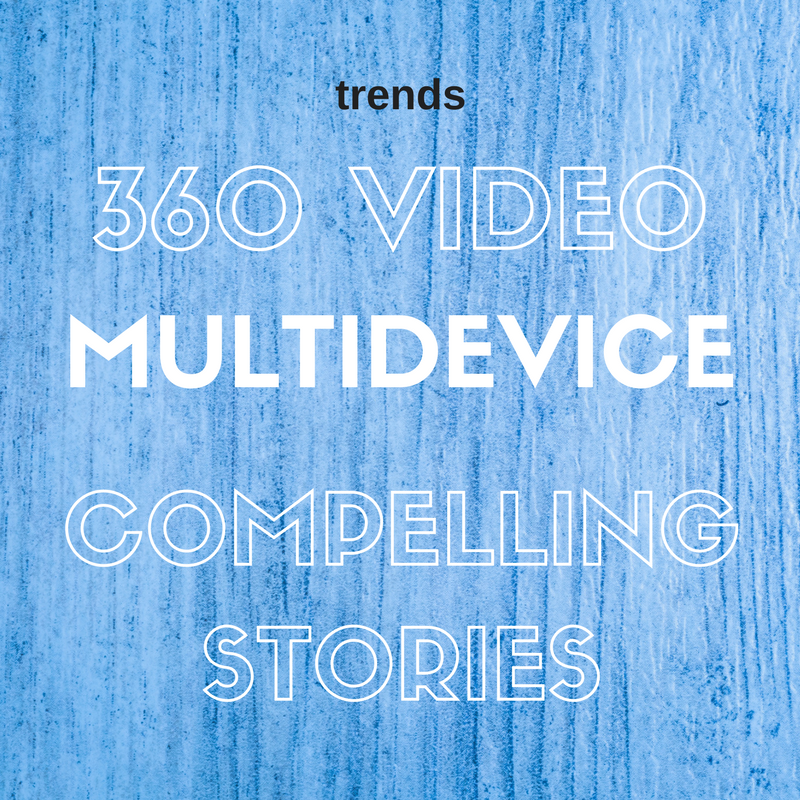 • 360-Degree Videos: One way to ensure your viewers stick with your video is the use of 360-degree videos. Viewers are entranced by these videos. 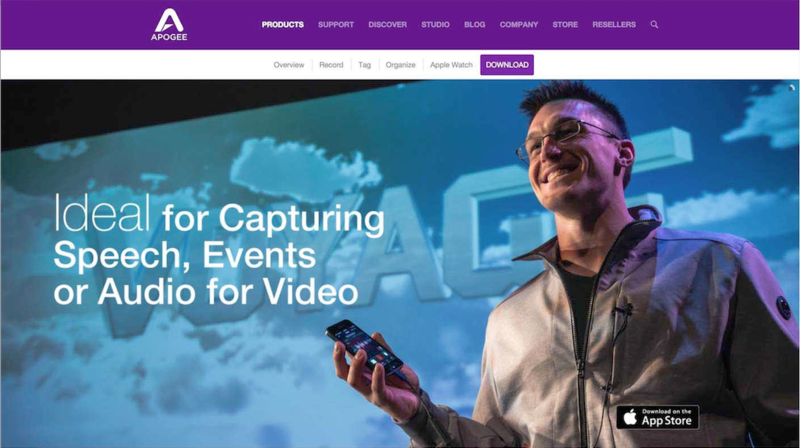 Magnifyre recently conducted a case study on a 360-degree video vs. fixed frame video and found 28.81% percent more viewers clicked into the 360-degree video (based off identical thumb-nails) and double the number watched the full video. 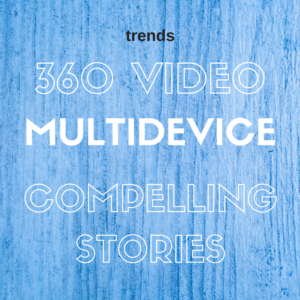 • Multiple Devices: Think with Google recently reported that 85% of adults ages 18 to 49 use multiple devices at the same time and two-thirds watch YouTube videos while sitting in front of the television. This means your videos need to be optimized for all kinds of devices. 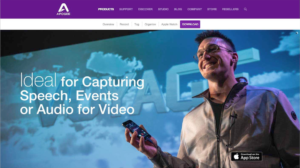 • Video Storytelling: While the world may see this as a trend, this is what professional video producers have known all along. Viewers will watch your video if it tells a compelling story. Compressing that story into a manageable time frame that will keep your viewers engaged and lead them to act on your purpose is the ultimate goal of video marketing. Now that you’re ready to join and/or take greater advantage of these video marketing trends, contact us to learn how get on track and rocket ahead in 2017. Every year, the way we market evolves. And thanks to the ever-changing tides of digital marketing, video marketing has become a predominant force in the world of business. 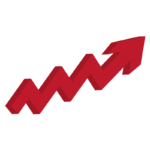 If you are going to successfully build a bigger following and garner new customers, you have to pay attention to the trends in video marketing. 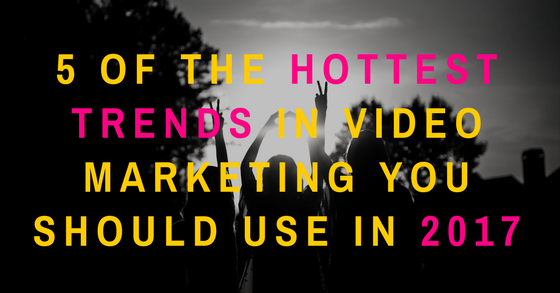 In this post, we will uncover five hot trends in video marketing to take advantage of this year. Greater Video Growth on Facebook: Newer social media platforms such as Snapchat were designed specifically for video whereas older social media platforms like Facebook were not originally intended for that purpose. But we have seen a recent and rapid growth in the use of video on Facebook. In 2016, the social media giant introduced us to live video streaming and it is becoming even more popular this year. Businesses should expect to see even more video uploading and sharing and more live video streaming as well. More Facebook users are using the site to view videos which makes it a huge goldmine for businesses who want to strengthen their brand through video. Information Meets Entertainment: In 2017, you won’t be able to have one without the other. It’s called “infotainment” and videos will need it if they will effectively capture the attention of the viewer. In order to better engage your target audience, you will need to create videos that provide valuable and interesting information while keeping the viewer entertained. This can be done with high quality video content, illustrations, animations, music, and most importantly, resourceful, useful, and intriguing information. 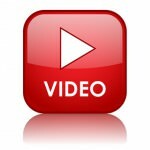 More Video in Web Design: More businesses will start implementing video content into their web design. Having short video on your homepage and other parts of your website will make it easier for you to connect with and engage your website visitors. When someone who has never been to your website before sees a click-worthy video (not spammy, but eye-catching and notably interesting), they will be more likely to view it and stay on your website longer. Shorter Videos Will be on The Rise: Remember those annoying advertisements that would play before you could view a YouTube video? They still exist, but now there is an option to skip the two minute ad after waiting for five seconds. The smart brands have wised up to this and now create videos as short as fifteen and even five seconds. That really requires brands to step up their game and come up with innovative ways to craft a poignant, memorable message in as little as five seconds. Short videos aren’t just on the rise on YouTube though; if you want to create a video that your target audience will remember (and will actually watch from start to finish), you need to keep it short and sweet. You would be surprised by how much information you can squeeze into a ninety second video. Consumer First, Product Second: Videos will need to put more focus on the consumer and less focus on the product. And for this to happen, you will need to do a hefty amount of research on your target audience to have a thorough understanding of who they are and what they are interested in. Your videos should cater to your target audience’s interests and then after establishing trust, you can begin to focus more on showcasing what products you have. Focus less on advertising yourself and more on building you brand. And the key to successful brand building is to personalize your brand. Video is one of the most influential ways to do that. Want to learn more about the 2017 trends in video marketing and how you can take advantage of them? Contact us today! Are you a dance studio looking to grow your business? If so, it’s high time you look into professional photography for your studio. Commercial photography is one of the number one ways to increase your visibility and get the word out about your business. Why aren’t you taking advantage of this opportunity? 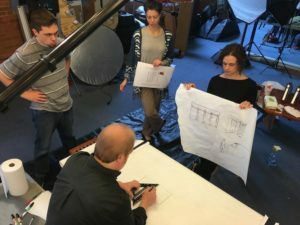 Below, we answer some common questions about why and how to get and use some awesome professional images in order to pull more people into your studio. 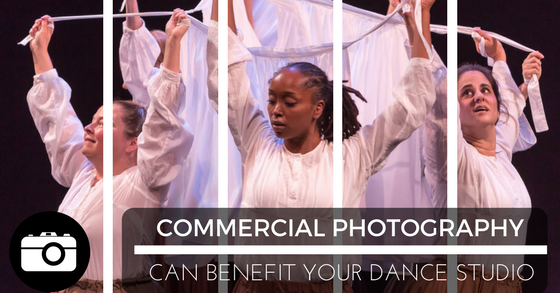 Read on for a good idea of what professional photography has to offer your dance studio, how to get the very best images possible, and how to use those images to your advantage. Why should I use professional photography to promote my dance studio? Images draw the eye. A brochure, website, or billboard with a photo is much more likely to pull in the attention of your desired audience than one without an image. However, using a poorly shot photo for this purpose can put your business in a bad light, causing you to lose potential customers. 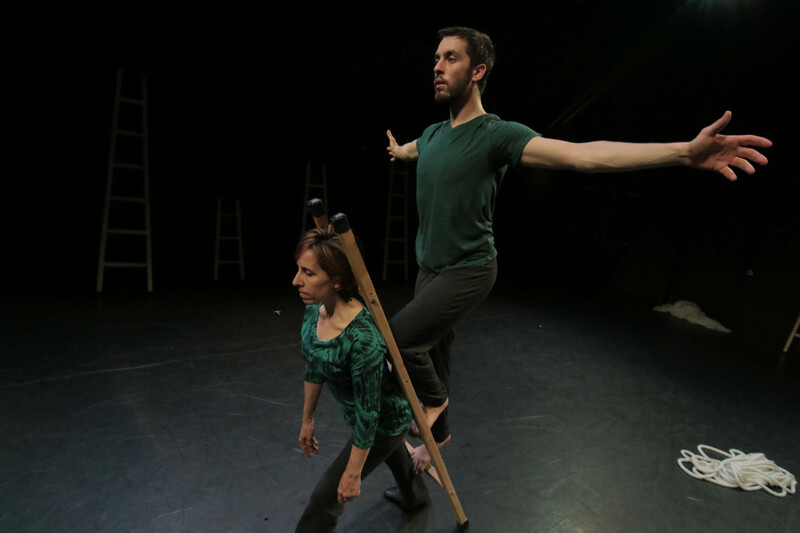 Rehearsal photos for Judy Dworin Dance Ensemble, Photo by Miceli Productions. Instead of using amateur snapshots, set up a time to have a professional photographer take some photos of your dancers in action. These pictures will draw people into your promotion by showing them exactly what the results of studying at your studio can be. How should I have my dancers prepare for a professional photo shoot? To begin with, choose only a few of your very best dancers. 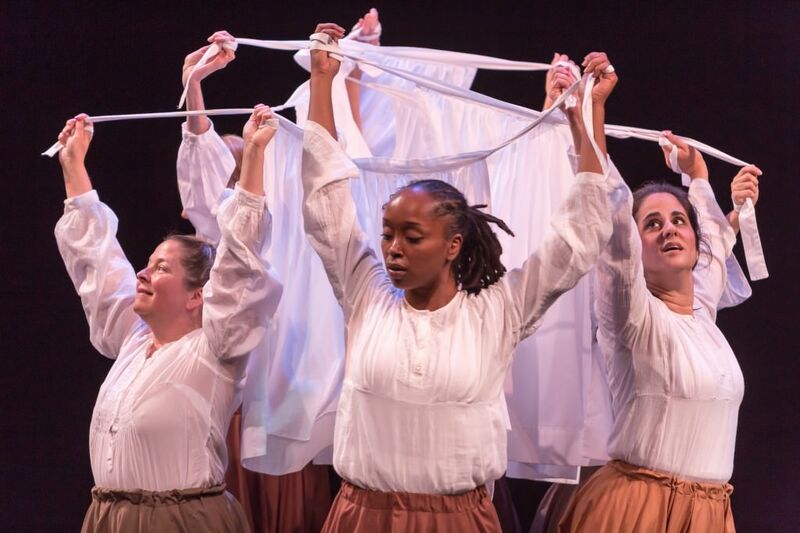 The better the dancers are, the more likely you are to get excellent shots that show off the technique your studio strives to instill. 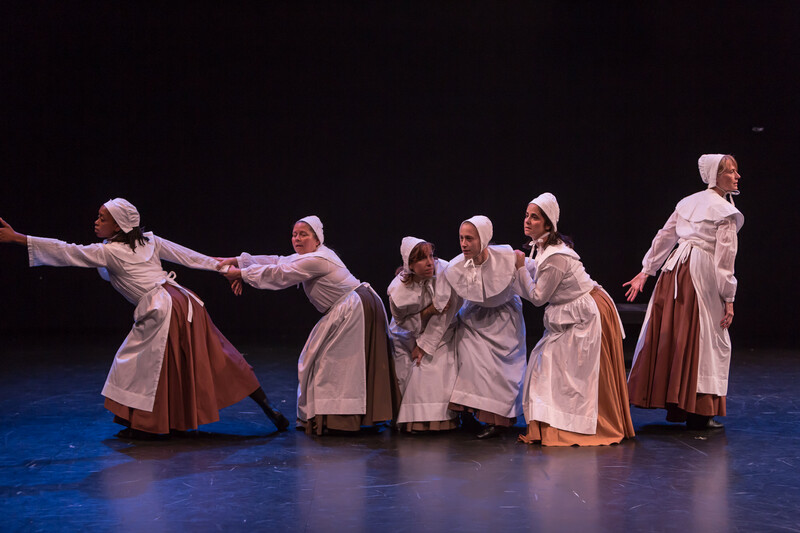 Additionally, smaller groups of dancers and solo dancers are more likely to photograph well. Instruct your chosen models to come to the shoot wearing what they would wear in a performance, with hair pulled back nicely and makeup on. Discuss with them the dances, combinations, and movements they will be doing in the shoot and make sure they know to use their very best technique throughout. What is the ideal location for a dance photo shoot? This is something you will want to discuss with your photographer. In general, outdoor photo shoots can make use of sunlight to come out looking very crisp and natural. Outdoor shoots are challenging due to weather concerns and scheduling rain dates. For this reason, it is best to discuss the photo shoot location with your photographer and decide on a solution together. This could mean finding an outdoor location with a nice flat surface, it might mean taking your dancers to the studio of your photographer, or it may even mean the photographer visits your studio or rehearsal space and brings equipment. How should I use the professional images once I have them? 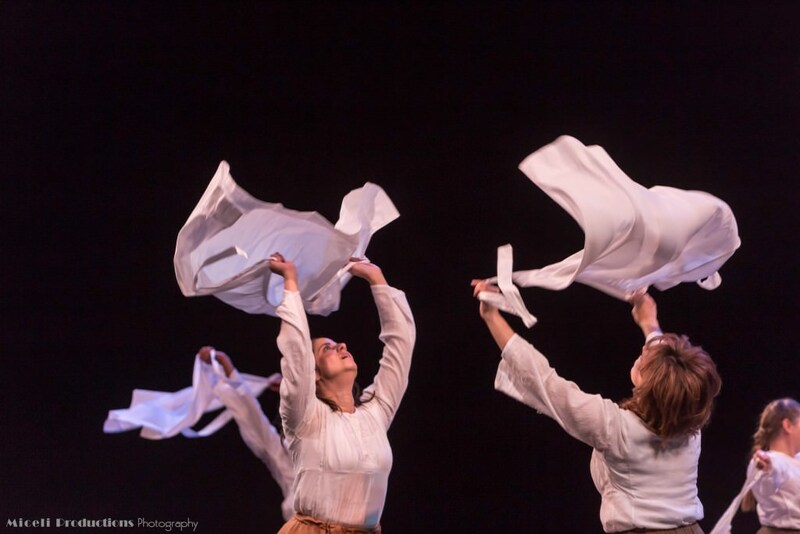 Professional images of your dancers can be used in a variety of ways. Put them together into a slideshow to be used on your website or in a TV advertisement. 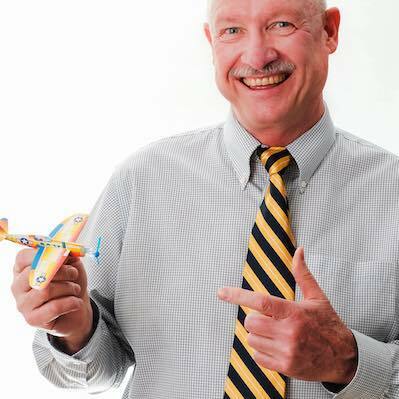 Use one on a local billboard, or include one or two awesome images in a magazine ad. Because professional images are of the highest quality, they can be used to advertise in almost any way imaginable and will always leave your studio looking professional and well-presented. Don’t wait. Book an appointment and get started. Contact us today for more information! What Questions Should You Ask Before Starting a Video Production For Your Business? 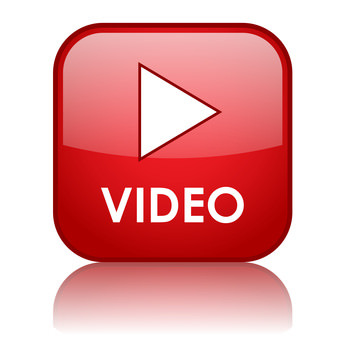 By now you have probably been made aware of the wonders of video content for business. There are endless benefits to producing video for your business and integrating it into your marketing strategy; you are better engaging your target audience, giving your followers an inside look at your company, and creating the opportunity to explain your products and services. But before you jump into producing a video for your business, you want a concise vision of your expectations and goals. In this post, we uncover five questions to ask yourself before using video production for business. What is my Budget? Determine how much you are willing to spend or how much you can actually afford. Once you have set a budget, you will have to make sure the expectations you have for the production of your video fit your budget. A professional video producer can help you determine what you are able to accomplish with the funding you have. What’s The Purpose of The Video? Without understanding the purpose of your video and why you are creating it in the first place, it is going to fall apart. And without having a definitive purpose for your video, you won’t be able to convey your vision to the professional who is producing your video. Is the video a tutorial? Is it an inspiring story about the inception of your business? 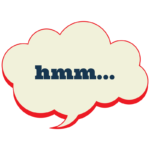 Is it a sneak peak promo that gives viewers an inside look at a new product or service you are developing? Your target audience won’t understand the purpose of the video if you don’t understand it. How Long do I Expect The Video to be? The length of the video should also be considered when you are first establishing the budget that you have to work with. How much content do you have or how much information are you trying to fit into the video? You would be amazed at how much you can convey in a one minute video. As a general rule of thumb, strive to make your video be clear and concise for today’s shorter attention spans. However, you want to establish the type of video you seek to create before determining the length of time you want it to last. What Are my Audio Needs? 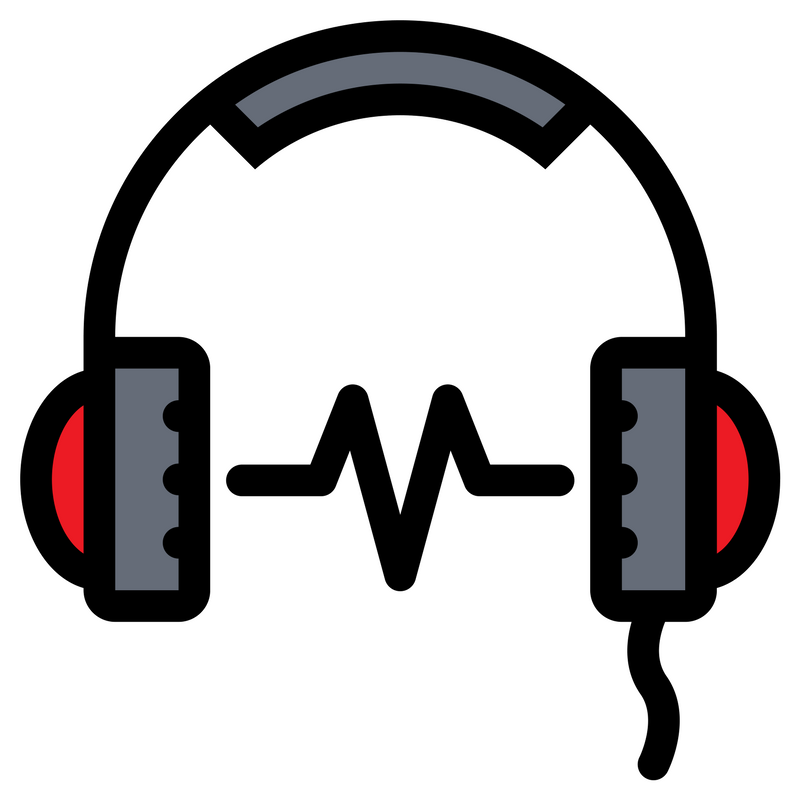 Audio is a critical component of any visual piece of content. 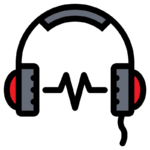 There are a series of questions you need to ask yourself regarding the audio of your video. Do you want music included in the video? What genre of music? Or do you just want certain sound effects that go along with animations? Also, you need to determine the tone of the video. Is it serious and dramatic or lighthearted and comedic? Is the video being narrated and who is doing the voice over (if there is one)? 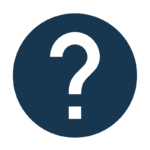 Consider all of these questions and have your answers ready to present to the video producer before starting the project. How Can I Make Sure That my Audience Loves This Video? While you can never guarantee the response of your target audience, there is plenty you can do to make sure you have an exponentially better chance at impressing your audience. And this requires doing some research. Come up with five words that best describe your target audience and consider those characteristics when creating the video. Also figure out whether your followers would be more responsive to certain images, visuals, graphics, or any other element that goes into the video. When you know your target audience, you can create a video that will garner better responses and possibly lots of social shares. 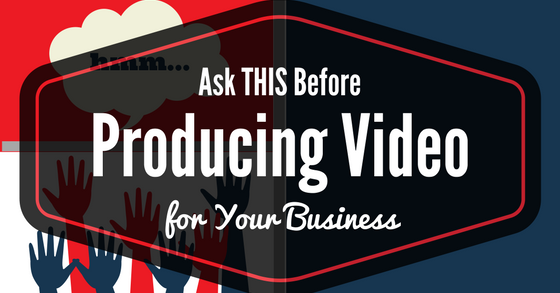 Looking for more advice on creating the perfect video for your business? Contact us today! IN THE STUDIO is a behind the scenes look at our work as artists & entrepreneurs. Welcome! © Copyright 2017 by Miceli Productions, LLC. All Rights Reserved.